The summer travel season isn’t over quite yet, and you still might be looking to take some trips with your family and friends. You can’t always pick up and leave home, though – especially if you have pets. With this in mind, the TSA has provided travelers with some tips on how to make it through the airport with their furry family members. Not every dog or cat is used to a crate. If this is the case for your pet, you might want to start letting it acclimate to the new conditions a week before you take your trip. Put some treats inside the carrier so that your pet can make positive associations with it. Ensure there is no clutter inside of the carrier either. Once your pet is used to being inside the carrier, take it for a ride in the car and walk around with it. This will allow it to get used to the vibrations. TSA spokeswoman Lisa Farbstein advises that you leave a collar and leash on your pets while traveling. Many animals panic when they are taken to new places, and all of the noise and foot traffic can be very overwhelming. Keeping your pet on a leash will prevent it from running away at the first opportunity. She also suggests bringing an empty water bottle with you that can be filled after the security checkpoint. You have to make sure your pet stays hydrated throughout the flight. Be sure to check in with your airline before the trip to make sure that your crate or carrier can fit under your seat. 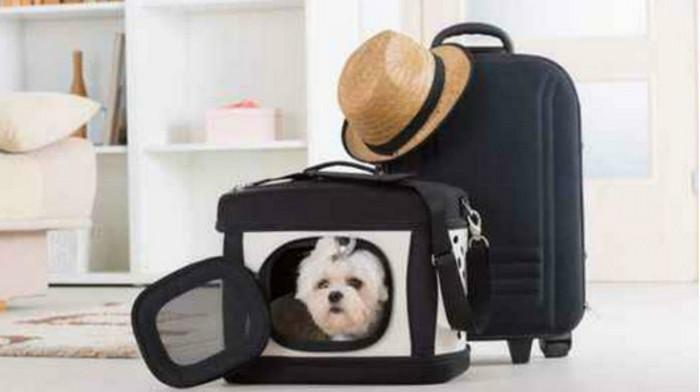 Cancellations and connecting flights may be smaller, and if your carrier is too large then you may have to check your pet with the rest of your baggage. Not only will this cost you money, but it may be unhealthy for your animals. Cramped, hot spaces are much worse in the summertime, and you will have no way of knowing if your pet needs water or anything else. Plan accordingly! Be prepared for your carrier to be inspected when you get to the security checkpoint. Officials will remove your pet from their carrier to make sure there are no hazards or contraband items. Your animal will have to go through the metal detector with you, and it may be inspected more closely to make sure everything is on the up-and-up. Airlines are becoming more welcoming of pets in the cabin. JetBlue has a frequent-flier program for pets called JetPaws, where you can earn extra miles by flying with your pet. Frontier Airlines has also begun to allow small pets in the cabin for a $75 fee for each flight. Previously, it had only allowed pets to travel as baggage. Although they are becoming more accepting, be sure to book your flight as soon as possible. Many airlines have limits on the amount of pets they allow in the cabin.